Earlier in the week, we started getting notified by US wireless carriers that RootMetrics, an independent mobile analytics firm, was about to release its latest report that ranked Verizon, AT&T, Sprint, and T-Mobile based on their 2015 end of year performance. On one hand, we had Verizon prepping us with news about their big win for the 5th consecutive report. On the other hand, we had T-Mobile in full conspiracy, damage control mode, releasing statements from CEO John Legere the minute the report went public. Boy, these are always fun times. For those not familiar with RootMetrics, just know that they are one of a handful of groups who test US wireless carrier performance and then share with the world their results. They claim to be independent, though I think it’s clear that John Legere isn’t a believer in that idea being true. In their latest report, they performed almost 4 million tests, drove over 200,000 miles, tested 6,607 indoor facilities, and attempted to cover 100% of the population in doing so. They release two reports per year, one to show performance for the first half of the year, followed by another for the second half of the year. Their reports are quite exhaustive, though very detailed and open in how they came to their results. Verizon has topped their rankings for five consecutive reports, including this one. In the reports, they show state by state performance, which carriers top each, who dominates metro areas, and also who ranks the best in areas like overall performance, network reliability, network speed, data performance, call performance, and text performance. 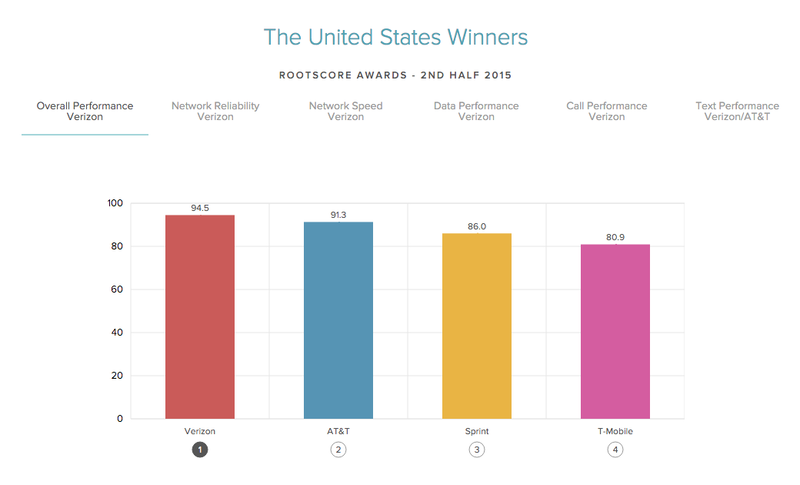 For first place rankings of overall performance, network reliability, network speed, data performance, call performance, and text performance in the US, Verizon topped each category. One could read that as Big Red being the best in every single category that most people care about in terms of network performance. AT&T did tie them for texting performance, though, so it’s not a clean sweep. 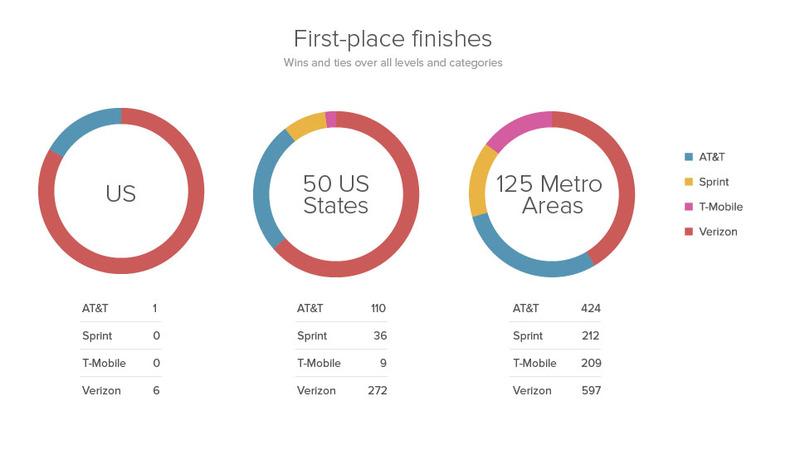 At the individual state level, Verizon gathered up 272 first place finishes for those same categories, while AT&T came in at a distance second with 110. Sprint and T-Mobile each grabbed 36 and 9, respectively. In metro areas, Verizon piled up another 597 first place votes, while AT&T grabbed 424. Sprint and T-Mobile each captured 212 and 209, respectively. Those billions spent went towards expanded XLTE coverage, expanding into additional rural areas, and handling increased traffic with the use of new small-cell systems. Verizon is clearly thrilled with RootMetrics’ results. I think it’s safe to say that John Legere appreciates the work of RootMetrics as much as he does the EFF. In a statement to the press, Legere thinks that RootMetrics should be “banned as an independent source” for network testing because they have “manipulated their testing of the T-Mobile network” and their results are “worthless” because they may be up to seven months old. Legere also asked if T-Mobile needs to start paying RootMetrics “millions like the other carriers to get them to stop deliberately turning off significant portions of our network and skewing results during their drive tests.” Yikes. See what I mean? In his statement, Legere then tossed out a bunch of “flaws” and “facts” about this report to try and poke holes through it. For one, RootMetrics admitted that they turned off T-Mobile’s Voice-over-LTE (VoLTE) during its testing of calls. They didn’t exactly provide a great reason for doing so, only that they plan to test it for the next report. As Legere points out, T-Mobile’s VoLTE handles roughly 50% of their customers’ calls, so that actually does seem like a bit of mistake on RootMetrics part to not test this feature. Legere then goes on to point out that the data may be old and that their testing for all networks doesn’t seem to be the same or with the same devices. While I would agree that there should be some standards set (which I would imagine RootMetrics actually tries to use in almost all situations), the argument about the data being old is just a part of reports like this. This is a 2nd half of 2015 report, so yes, it includes data dating back seven months ago. That’s pretty obvious. When the 1H report comes out for 2016, it will also include data up to seven months old. Any fool understands that. The point is that even if it is seven months old, this is what the data showed for that period of time. The next report will show if T-Mobile has made a bunch of changes between now and then, which they claim to have done. Look, I don’t get too invested in these reports, but if anything, they should just be more motivation from all carriers to continue to make their networks better. Both Verizon and T-Mobile claim that they are still heavily investing in theirs which is nothing but good news for you and I. You can read the full report for yourself at RootMetrics’ site. This is the "HTC One M10 in White."